I am happy, excited, deeply grateful and humbled to connect with my readers and get their feedback on my first book. I love that they email, facebook, call or stop me as I go about my day to day life to tell me that they love my writing style and storytelling ability. I love that some of them emailed me at 2 o'clock in the morning after picking the book up to read a bit before sleep and couldn't put it down! But most of all I love that I've inspired some to consider a new perspective, explore a bit deeper and take action to find more meaning and magic in their lives! With love and gratitude to all who have supported me on this amazing journey and to those who stand beside me as I explore the next steps on the path! Fabulous book!! Highly recommend it! I absolutely loved this book and need to get it back from my mother! It was an inspiring story of life.... thank you! I absolutely loved your book Trisha. I started and didn't want to put it down. The entire time I was reading I had warm tingles - it touched me in a profound way. Loved it and love you. Thank you for sharing your magic with the world! When is the movie coming out! I devoured your book ... every word from cover to cover. Living a sense of deepening connection to you and to my soul through your story. A special thank you for the Appendices, which gave me some tools to work with as I discover my next steps! With deepest gratitude, Thanks a Million! I just finished the book! It is an amazing story ... touching, mind blowing and inspiring! I am so happy that you are sharing it with the world! I finally started reading your book last night - was so hard to put down! Hope to finish it tonight by the pool. LOVING IT! It's making me think about what I have ignored in the past! Thank you :) ~Barbara B.
I can not tell you how much your story has touched my heart and inspired me. I have such gratitude for you and your work. I LOVED your book! The story captivated me and I couldn't put it down! But more importantly, you've inspired me to find the deeper meaning in my life. Thank you! I just finished your book. Just wanted to let you know that I really, really enjoyed it! Reading the best book ever! I've already laughed cried and caught myself saying "me too!" This book speaks to my soul! I was so engrossed I managed to finish it in less than 24 hours ... With a 2 month old and not quite 2 year old to wrestle. Couldn't put it down! I read this book in two days and between the two sittings it took me to read it, I couldn't wait to pick it back up. The good writing carries you effortlessly along the path of two stories, which are fascinatingly intertwined. The unfolding of both stories kept me completely engaged and Ms. Jacobson's candor and insight on the metaphysical aspects of our lives, which many of us experience but often don't share, was refreshing and inspiring. You won't forget this book. I just finished reading your book and loved it. Great story that resonated with me with many of the characters. Opened my eyes to thinking about what might be happening when people come into out lives - entertaining read that I enjoyed end to end. Thanks! "Match Meets the Metaphysical is a must read! This book can and will open your eyes to the magic of the Universe, the synchronicity we all experience, and the timeless love we are capable of. This story is near and dear to my heart and has changed my life in more ways than words can express. I am incredibly grateful for the opportunity to help share it. If you've felt a connection with this book I urge you to share the book, share your thoughts, and share your own story!" "Jacobson captures you from page one. The story keeps your mind thinking and leaves you wondering what lessons the people in your own life have to teach you. The relationship of Julia and Greg throughout the book is unique and teaches you that sometimes people are in our life for a reason that is beyond our control. Jacobson takes readers into the metaphysical world and helps us to understand the deep connections we have with each other. This book opened up my eyes to my own life situations and drove me to want to find my own passion and purpose in life. This inspiring author has so many lessons to teach us and I'm already waiting for her next book! 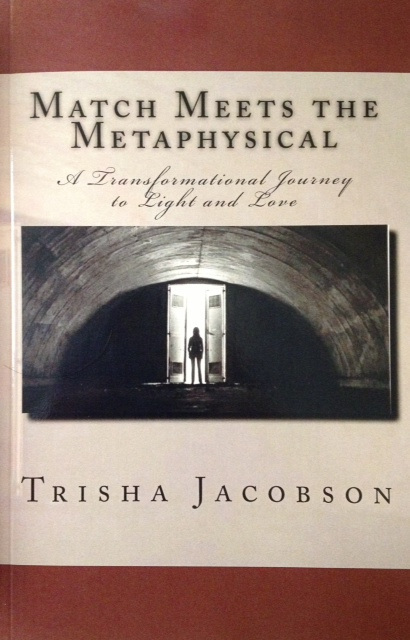 Match Meets Metaphysical is a great read and I highly recommend it to anyone who wants to understand their life!" Reading this story I felt as though I were having a conversation with a good friend. I found myself experiencing an array of emotions. I laughed. I cried. I felt chills but mostly joy and love. I’d pick the book up every time I could find 15 minutes and I always felt happier after reading just a few pages. Reading about Julia’s experiences and seeing her transform and grow was very inspirational. I became aware of a connection within myself. I started out reading this book as an escape; it is that and so much more. I highly recommend this book to all, as I believe everyone will walk away with something more than before they read it! "Cover to cover ... loved it!" "I just finished reading your book. Believe me when I say I simply couldn't put it down. Nice job!" "I started reading today. I'm hooked!" My sister and I have recently finished reading your book and we must say it was phenomenal! It literally took us only a day to read it and we often found ourselves saying “Oh my god, did you get to this part yet? !” I just wanted to let you know that we loved your writing style and your story; I am so happy you were willing to share it. I will definitely be recommending it to all of my friends! So ... I was having trouble settling down last night and I decided to take your book to bed with me to help me wind down. Well, I couldn't seem to put it down and I found myself having to force it out of my own hands. I woke up shortly after 4 this morning and the first thing I did was pick up your book. I'm loving every minute of it ... so much so that I find I'm re-reading parts so that I don't miss anything. Thanks Trisha for writing such a wonderful book. I would say that I can't wait to finish it, but I almost don't want it to be "done". Fabulous first book!! Highly recommend it! Read more Amazon reviews here.